Ultra strong double wall construction consists of a thick thermoformed ABS outer case welded to a rigid inner case fully cushioned in plush velvet. Patented double wall construction assures maximum shock absorption without breaking. Hardened steel locks and hinges are recessed to to prevent damage on conveyor belts. 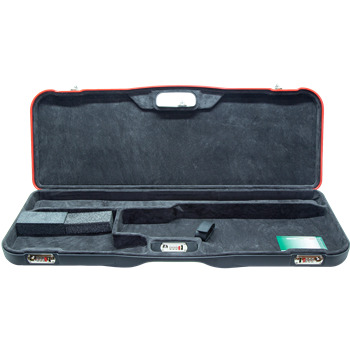 Separate compartments for stock and receiver, barrel and forend as well as accessories. All materials used are certified to not out gas or corrode firearms. Limited lifetime warranty.